Price: $29.99 on We Love Macs. Available soon on Amazon. Many of us have multiple electronic devices that need daily charging: iPhone, iPad, Kindle, spare batteries, and the like. Who wants to have these devices charging in different areas of the house? The Antec 4 Port USB Charging Station solves this dilemma nicely. The Antec 4 Port USB Charging Station has two USB 2A ports for charging iPads and other tablets, and two USB 1A ports for iPhones, iPods, and other smartphones or USB devices. Simply plug your devices into the charger, then plug the Antec 4 Port USB Charging Station into any wall outlet. Up to four items can be charged at once. In my tests I found my iPhone, iPad, and Kindle charged in the same amount of time as using their dedicated chargers. The major benefit of the Antec 4 Port USB Charging Station is the ability to charge multiple devices with less cords in a smaller footprint. And it fits well in a power strip without getting in the way of other plugs. If you do any traveling you know hotel rooms have inconveniently placed outlets. Cruise ship staterooms are worse: one outlet in the bathroom and one in the cabin. Plus it’s impossible to get a charging brick in an outlet placed an inch over the desktop and in a corner with barriers in the way. 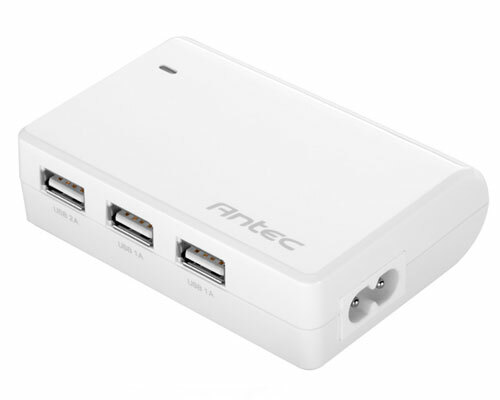 The Antec 4 Port USB Charging Station is a perfect travel companion. The two-prong plug fits easily in any outlet. When I travel I bring practically every electronic device I own, so the Antec 4 Port USB Charging Station is a big help and time saver for me. Anyone household that has multiple electronic devices should own the Antec 4 Port USB Charging Station. It will save time, space, and tangled cord aggravation.